Tracy, Karen and Maria had completed a winter trail running course with the company Icicle in January 2017. I was the only member of Quali-tea-m who was not able to attend; however, I benefitted from Kingsley’s tuition over that weekend and it helped us all complete the RTTS 2017. 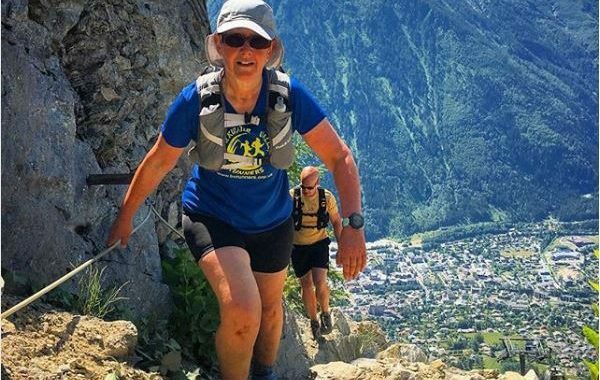 When Karen suggested a week in Chamonix in the summer of 2018 it was a fab idea! I love mountains, I love rock, I love traveling on my legs and completing journeys. I was in! I knew I wanted to take less of me up the Alps than I did along the Ridgeway so slow steady weight loss from the beginning of January 2018 meant I was lighter. I also needed a stronger core so regularly attended Pilates and worked on ‘yoga for runners’ antics on the rug in front of the TV. I needed to sort out basic reliable kit and a hydration regime. Brooks Caldera turn out to be better than Hoka shoes; my expensive Raidlight vest held everything I needed. And drinking diluted electrolytes rather than water worked on long runs, with salt tablets for those runs in very hot weather. Tribe bars and some real food like crisps, peanuts and cheese are enough to keep me going. What did we do with Kingsley? We followed some of the loveliest trails in the Chamonix valley: both sides, through the forest and woods, the alpine meadows, above the tree line, occasionally on snow and often along granite slabs. Our longest day was over 10 miles, the shortest just under 7 miles. Each day had at least 1000 feet of ascent and often more. Some days we travelled by bus or train to gain altitude and often we descended more than we climbed. We ran or walked until we reached a suitable ‘pause’ point. As we stood and chatted, we got to know the peaks on the Mont Blanc massif, saw the most amazing range of butterflies and flowers in the meadows and also shared a lot of bad jokes. Running uphill at a pace that was sustainable over a very long time. Walking was ok but the rules were to take it down a gear (think mountain bike) to a pace that your lungs and muscles could maintain. Small steps with toes slightly out to ensure you were using the right muscles, your quads and glutes and not your calves as they quickly get exhausted. Tottering upwards with rhythmic baby steps, knees lightly bent, toes pointing slightly down the slope if the path was cambered. If the path was steep and rocky, it was important not to overstride, but break it down again into baby steps and just keep on going steadily upwards. It was all about saving energy and ticking along steadily. Going downhill was very different. It was about not thinking and almost falling downhill just about staying in control. It was important not to use your muscles to brake and to stop your movement down. Kingsley tried to persuade us to fall and to jump down when you were not sure what to do next! Very hard to describe but once you are in the flow it feels great. Knees bent, a wide stance, trusting your shoes and looking just far enough ahead to know where the next twist in the trail came. Going uphill getting it wrong meant getting knackered and out of breath and ending up with sore calves. Having a sore bum at the end of the day meant you were using your glutes and getting it right! But coming downhill getting it wrong meant falling over. 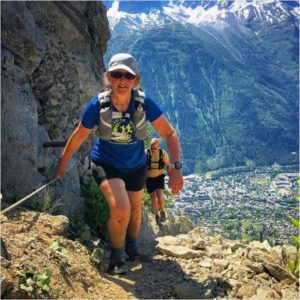 If you don’t lean forward when coming downhill, your feet can slip out from under you and you end up on your bum – ask Karen about that. If you don’t lift your feet high enough when hurtling downhill, you trip and take a superman dive forward onto the path to skin all knees and elbows – ask Deb about that. And the edges of some of the paths are quite unreliable and you can fall off the mountain – ask Tracy about that. Yes, heaps of fun. Sharing a flat and living in very close quarters for a whole week was a giggle and we learnt more about each other than probably we really wanted to! We drank plenty of pink holiday wine, ate well and achieved more than we expected, ached in places we weren’t expecting and all gathered war wounds. Getting to Chamonix and living in that area for a week is not cheap but if anyone is interested in an away trip with some talented tuition from Kingsley I have already started talking to him about it! And we haven’t even mentioned participating in the Marathon du Mont Blanc festival…..